Margaret Sanger, totally unaware that her lifelong dream had become reality, spent the day at her home outside Tucson, Ariz. Since 1914 she had battled ridicule and rigid laws, even gone to jail, all in pursuit of a simple, inexpensive contraceptive that would change women's lives—and save some as well. Now she was 80 and retired from her globe-trotting efforts. No one from G.D. Searle & Co., the drug firm, thought to call the woman who had pioneered and pushed for funding to develop the world's first birth-control pill, called Enovid-10, a synthetic combination of hormones that suppresses the release of eggs from a woman's ovaries. Nor did she hear from John Rock and Gregory Pincus, the doctors who developed the oral contraceptive with $3 million that Sanger had raised from her friend Katherine McCormick, the International Harvester heiress. Sanger got the news the next morning when her son Stuart and granddaughter Margaret read the newspaper. There they found a five-paragraph story announcing the Food and Drug Administration's approval of the pill as safe for birth control. The two, who lived next door, ran across the yard and opened the sliding glass door to Sanger's bedroom. It was 7 a.m., and she was eating breakfast in bed. Without the least bit of elation, just a sigh of relief, Sanger said, "It's certainly about time." Then perking up, she added, "Perhaps this calls for champagne." Her son, a doctor who had patients waiting, and her granddaughter, due for class at nursing school, begged off. So Margaret Sanger, who had made a lifelong crusade of birth control after seeing her mother die at age 50, worn out by 18 pregnancies and 11 children, celebrated her victory alone—but triumphant. 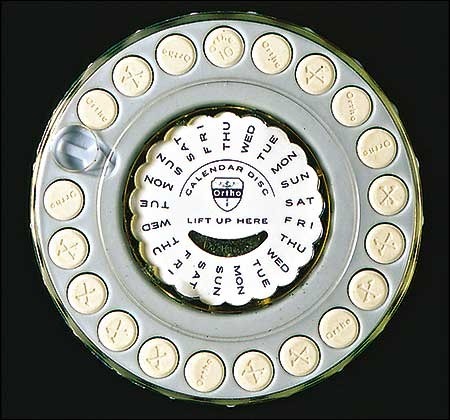 The birth control pill was introduced to the public in the early 1960s. Birth control pills are synthetic hormones that mimic the way real estrogen and progestin works in a women's body. The pill prevents ovulation - no new eggs are released by a women on the pill since her body is tricked into believing she is already pregnant. Margaret Sanger was a lifelong advocate of women's rights and the use of birth control. During the 1930s, it was discovered that hormones prevented ovulation in rabbits. In 1950, while in her 80s, Sanger underwrote the research necessary to create the first human birth control pill. Sanger raised $150,000 for the project. Frank Colton was the inventor of Enovid, the first oral contraceptive - National Inventors Hall of Fame. Carl Djerassi was the inventor of modern oral contraceptives or the pill. - National Inventors Hall of Fame. On June 10, 1957, the Food and Drug Administration (FDA) approved Enovid 10 mg (9.85 mg norethynodrel and 150 µg mestranol) for menstrual disorders based on data from its use by more than 600 women. Numerous additional contraceptive trials showed Enovid at 10, 5, and 2.5 mg doses to be highly effective. On July 23, 1959, Searle filed a supplemental application to add contraception as an approved indication for 10, 5, and 2.5 mg doses of Enovid. The FDA refused to consider the application until Searle agreed to withdraw the lower dosage forms from the application. On May 9, 1960, the FDA announced it would approve Enovid 10 mg for contraceptive use, which it did on June 23, 1960, by which time Enovid 10 mg had been in general use for three years during which time, by conservative estimate, at least half a million women had used it.